The list is in chronological order and selectively spans the Islamic age based on available records. There is little, if any, record of the numerous masters of architecture that built some of the early Islamic and pre-Islamic world's wonders of Iran. It is unknown who built the palaces of Bishapur, Firouzabad, Persepolis, Susa, or the many other spectacular ancient edifices of Greater Iran. No record of their names exists. Only the ruins of what they built give us a faint indication of what masters must have walked the face of this earth eons ago. 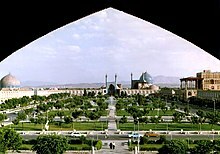 Dariush Borbor: Bazaar Reza, Mashhad, Museum and Library, Mashhad. Described as "one of the most innovative architects who is perhaps on the way of creating a Persian architectural style of the 20th century". Recipient of the Gold Mercury International Award from Italy, and 50 Outstanding Architects of the World from the Second Belgrade Triennial of World Architecture. Nader Khalili of CalEarth Institute. Founder. Featured on Los Angeles Times and The New York Times. ^ Architecture: formes + fonctions. =Books.google.com. 2010-11-10. Retrieved 2017-06-17. ^ “Borbor Consulting Architects Presented with, Tehran Journal, Tehran, December 22, 1976, p. 2. ^ Karolina Udovički; Aca Arsenijević; Milan Bosnić; Milan Kopanja; Ivica Mladenović, Drugi beogradski trijenale svetske arhitekture : [50 istaknutih arhitekata sveta] = The Second Belgrade Triennial of World Architecture : [50 outstanding architects of the world] : Beogradski sajam, hala 2, 4-12 juni/June 1988, Savez arhitekata, Beogard, 1988. ^ Akiner, Shirin (1991). Kegan, Paul, ed. Cultural Change and Continuity in Central Asia. Routledge. p. 293. ^ "Baha'i House of Worship - Ashkabad, Central Asia". The National Spiritual Assembly of the Baha'is of the United States. 2007. Archived from the original on 8 August 2007. Retrieved 2007-08-03. ^ Rafati, V.; Sahba, F. (1989). "Bahai temples". Encyclopædia Iranica.